Now i wouldn’t be surprised at all if you didn’t first think of Warburton when you came to this site. In fact Warburton hadn’t crossed my radar until a few years ago when a few brass friends mentioned in passing that they make a woodwind mouthpiece in addition to their brasswind pieces. Curious about this development I went to their website to view their saxophone offerings. To my dismay at the time they had baritone mouthpiece in development but not ready. Rather than invest in a tenor piece I decided to wait. 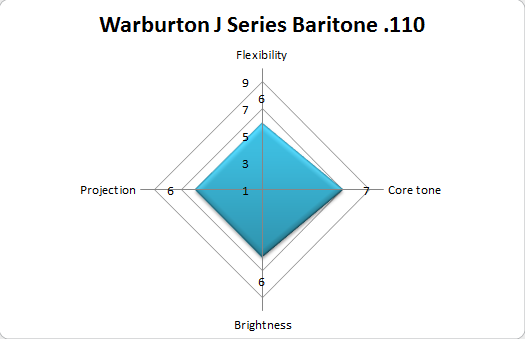 After a few years I forgot about Warburton until an offer I couldn’t refuse crossed my email box and then I had my very own J-Series piece at the .110 tip opening that I prefer. DISCLAIMER/REMINDER: As a general rule, the sound you get from any mouthpiece is dependent on a number of factors. These include the players physiology, the horn, the reed chosen, the mouthpiece and most importantly the players sound concept. The sound concept is the internal tone each player hears in their head. If you prefer a darker tone then no matter what your body will find a way to darken the tone. Consider how Don Menza can sound like Webster, Coltrane, and Hawkins just by hearing the sound in his head. His well practiced body then makes changes to give him the desired tone. Construction: The material is a traditional hard rubber with a gentle sloping baffle and slight rollover. The sidewalls are straight and the tip and side rails are thin. I’m not certain of the chamber size but I do find that I have to pull the mouthpiece out off of the cork more than any other mouthpiece i own. that suggests that the chamber may be more medium than large. Mouth feel: The piece has a traditional hard rubber baritone mouthpiece feel. The beak is slim so it would work well for any size mouth. Personally I prefer a bit larger a mouth feel as I feel like it opens my airways a bit more. Reed friendliness: Reed friendliness is normally a function of how evenly and precisely the facign curve is and whether there is damage, even slight, to any portion of the facing. The facing of this piece was almost perfect when I dropped a .0015 feeler on it. Because of this and the layout of the curve it played well with most reeds I had. Though, I did have to move down a half strength from the RPC Rollover I had been playing prior (more on that later). Sound: This piece has is marketed as “designed for the contemporary player that wants maximum flexibility and a traditional hard rubber feel.” Without defining contemporary this leaves a lot of room for interpretation. In my opinion contemporary players sound much brighter than those of yesteryear. They tend to value the brightness and edge of modern pieces. If this is the measure that you use as well then this mouthpiece is not “contemporary”. It can be brighter if pushed but I wouldn’t call it bright at all but it’s not tubby either. It has a great blend of core tone and edge that when pushed can blend with almost any non-amplified group. TAKE AWAY: This piece can be found for around $200 new. This is a steal for what I now consider a good do almost anything mouthpiece. You can anchor the sax section in the big band or blow a few ballads in a small jazz combo. This piece will fit the bill. It’s easier to play and has more core tone than a Link and intonation is more spot on than you’d get from a high baffle Berg.